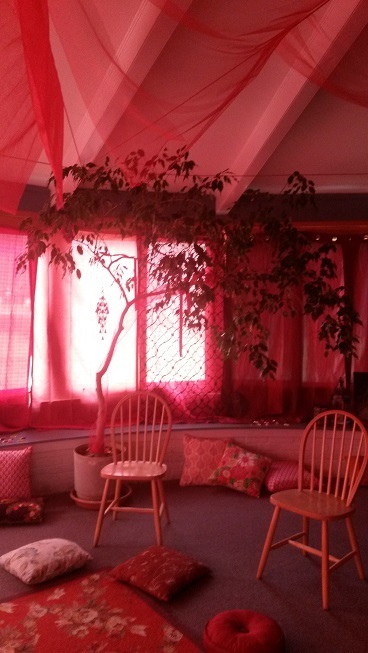 On March 15th, twenty-three culturally-diverse women, representing every decade of life from their teens to their seventies, honored the call from deep within themselves to gather in York, Pennsylvania’s first Red Tent. 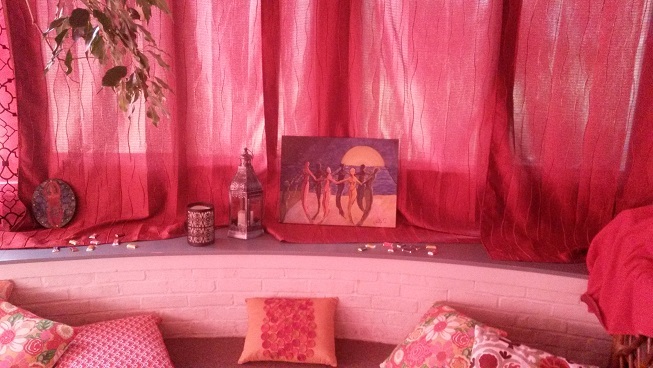 Coming from as far away as Philadelphia, these women gave themselves the gift of time– time to connect with other women & precious time to reconnect with their authentic Selves in a safe, nurturing space. The actual Red Tent event only lasted a few short hours but the vortex of positive energy it created affects me on a profound level to this day. Responses from many of the women, through an on-line survey I sent out after the event, show that it was powerful, provocative, & nourishing. The space was transformed into an exotic locale in the middle of the city. After leading women’s groups for years using curricula such as Cakes for the Queen of Heaven & Rise Up & Call Her Name, I’ve since created my own workshops for both women & men under the name Pure You: Awaken Your Authentic Selves. As I researched topics that I thought would stimulate thought & discussion in a women’s spirit circle, I came across the film, Things We Don’t Talk About: Women’s Stories from the Red Tent. This documentary by Isadora Gabrielle Leidenfrost records the grassroots movement of Red Tents popping up all over the country. 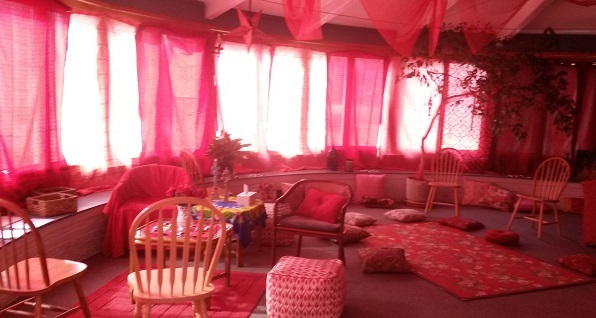 “A Red Tent is a red textile space where women gather to rest, renew, & often share deep & powerful stories about their lives.” It sounded exactly like what I wanted for the group. I watched the movie at home several times, secretly wishing for a Red Tent in my community, before sharing both the movie & the vision with others. 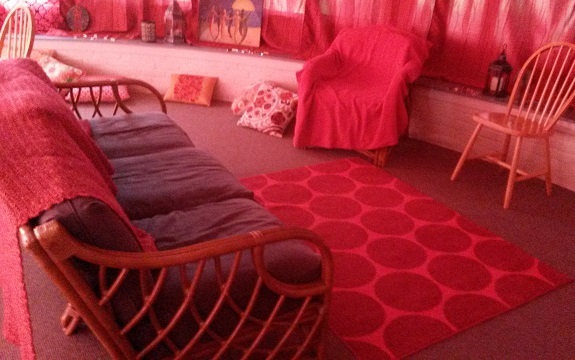 One evening last fall, I offered a “Red Tent movie night” with a discussion to follow. So many women wanted to attend that I had to offer it twice! Both times, the most popular question asked was, “When are we going to have a Red Tent here?” That confirmed what I had been thinking. The time was ripe to join the movement that was fast becoming an international phenomenon. There’s a saying that if no one presents you with an opportunity, you have to create your own. Despite being in uncharted territory & having a healthy dose of fear, I created the opportunity that I wanted all of us to share. 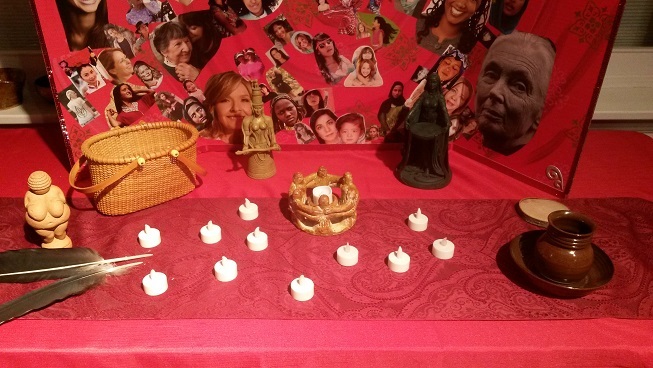 The Sacred Wisdom Circle where women could gather & share in a large group. My vision was to provide a safe, nurturing environment where women could find what they need to rejuvenate body, mind, & spirit. I wanted to create a place where they could be in the company of like-minded women, reconnect with their higher selves, & disconnect from the outside world for just a few hours. No demands, no obligations, no expectations. After organizing the overall format for the day, I stepped back & let it be what it needed to be. As facilitator & host, I took my cue from a phrase often heard in education, “Better to be the guide on the side than the sage on the stage.” This was OUR Red Tent not MY tent. 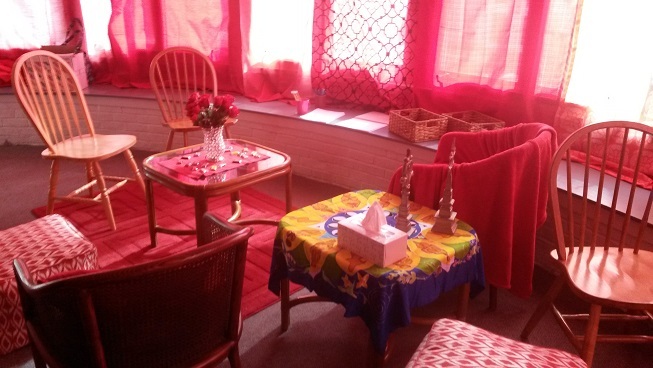 Creative Space: materials were provided so women could explore themselves through art and writing. 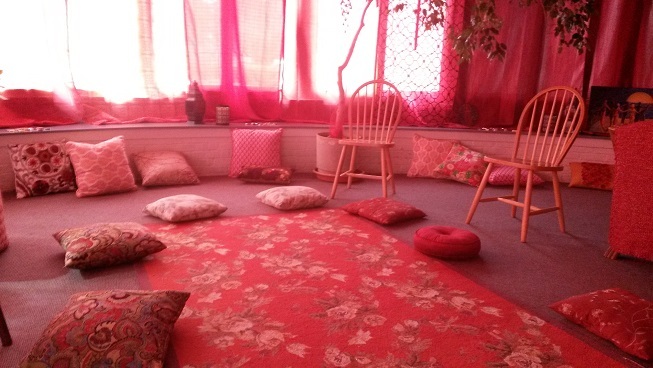 A space set aside for intimate conversation away from the larger Wisdom Circle. From the day I committed to organizing this event, I had to consciously maintain a healthy balance between the logistics required to plan such an event & the sacred intention that would make this more than “just another women’s group”. I had high expectations for myself & the Tent. 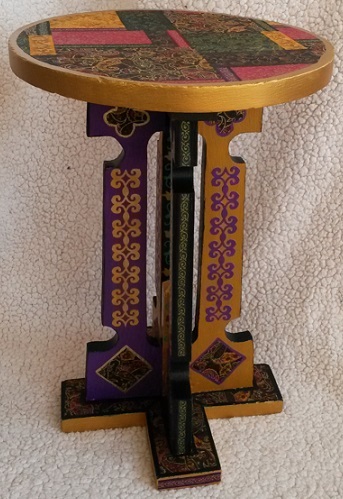 When I prepare for my Pure You spiritually-centered events, creativity workshops, & circle groups, I like to plan the structure (agenda) while recognizing the need for fluidity. I envision a membrane freely breathing in & out, a living organism that moves the spirit as opposed to rigid schedules that shackle the soul. The right amount of structure supports; it doesn’t stifle. Synchronicity is when the universe hears your prayers & answers them in mystical, mysterious ways. I never could have organized this Red Tent event without the many kindred spirits who offered their support. The space was graciously loaned to us by the Unitarian Universalist Congregation of York & its staff helped promote the event. Wonderfully artistic women helped create the space & several men offered their appreciation for what we were doing for their wives & girlfriends. (Eventually, I would like to do more for their daughters as well.) You know you are on the right track when doors open & someone is there to meet you on the other side. I am humbled & grateful beyond words. 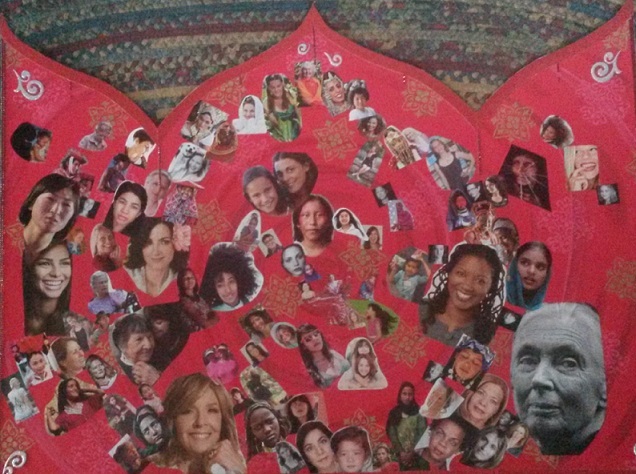 The collage honors women of all ages & cultures. Each woman lit her flame & put it on the altar to join the flames of everyone else in the Tent. I deliberately scheduled the first Red Tent to coincide with the Vernal Equinox, a time rich with symbols of new beginnings. It seemed the perfect time to start a new event for the community. Thanks to the feedback generously offered by many of the women, I have a better understanding of what they enjoyed about this event & what they would like to see different for the next one. While many Red Tents don’t have a “theme”, ours did. I chose “Embracing Change” because so many women expressed that they were in periods of transition– new babies, empty nest syndrome, caring for aging parents, & facing choices as they start new chapters of their lives after retirement. 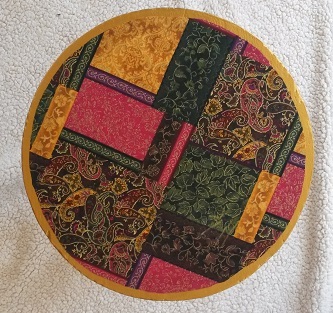 Someone once said, “The only constant in life is change.” By sitting in sacred council with one another, more of us clearly saw that what we were experiencing was not new & that we had sisters in our midst who had gone before & had wisdom to share. We ALL had wisdom to share. Raw emotions can appear & old wounds can reopen when women gather in a safe space & share their stories. I made it clear in the beginning that while we are here to listen & support one another, this is not an event that can take the place of talking to a professional. I had a small table near the exit for business cards, brochures, & emergency numbers of resources available to women in our city. Whenever I lead a group for spiritual or creative exploration, I take my responsibility for the women’s health & we;ll-being seriously, preparing as much as possible for the unexpected. Yes, I created a sacred space for women to gather in community with one another but it was the women who created the magic. I look forward to our June 21st Red Tent Event where our focus will be “Refilling The Well: Ways To Nurture & Nourish Your Self”.